Practical Organic Gardening – Growing Tomatoes! Fox Cherry tomatoes are a staple in my garden. As promised, it’s time to start thinking about what to plant. Most gardeners, me included, rely on one summertime favorite, the tomato, to grace their gardens every year! Tomatoes are pretty hardy plants. And they’re happy growing in containers. They’ll even grow hanging from a hook, upside down. So, even if you don’t have any space for a garden plot, even if you can’t grow anything else, you can grow tomatoes. If you’re new to gardening, you might want to start with a few tomato plants instead of starting seed. Why? 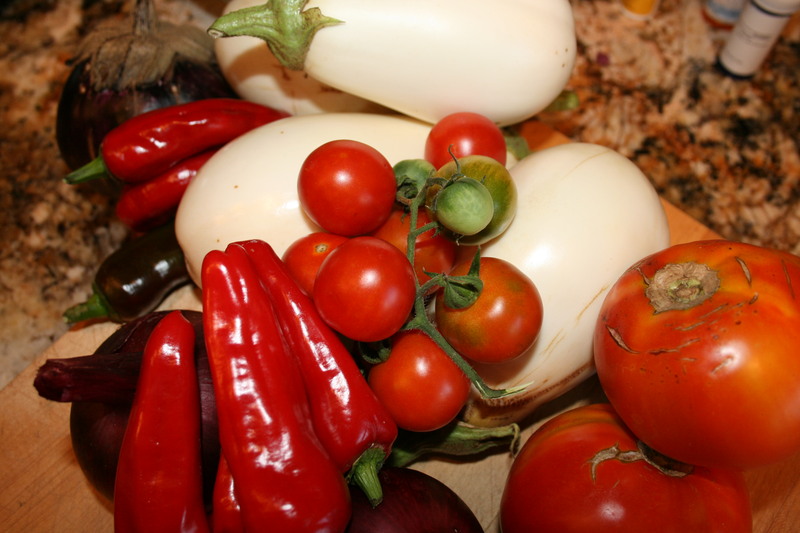 Most warm weather crops like tomatoes, should be started 10 to 12 weeks before your last frost. In my zone, Zone 6a, that means I am in the basement, filling peat pots and dropping in seeds in the second week of February. From the moment the seeds go into the pots until I get them ready for transplant, I have to pay attention – keep them warm, water them, feed them and ensure they are healthy and happy. 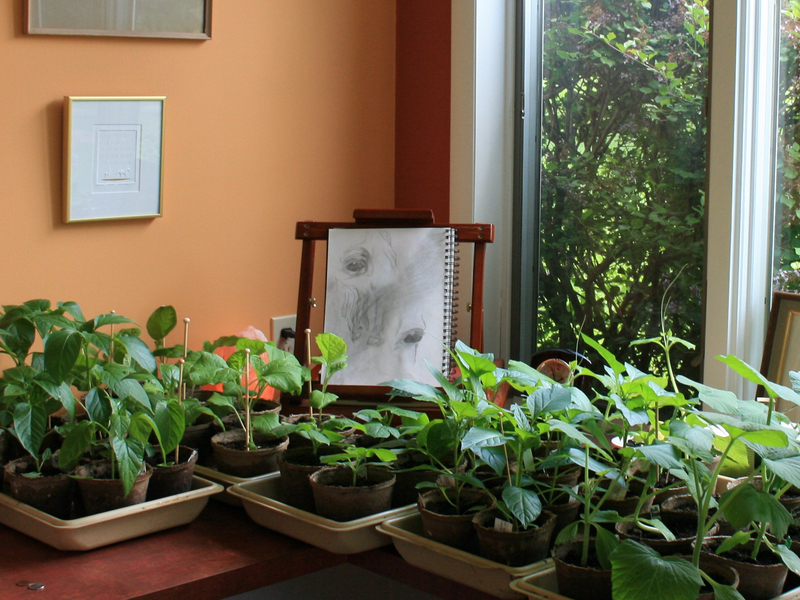 So, if you’re just starting out, buying plants may be a lot easier and a lot less risky. Before we talk about the hundreds of varieties of tomatoes available today, let’s talk about a couple of categories that you should know about when you pick seeds or buy plants, namely determinate and indeterminate. Tomatoes come in both these varieties. What’s the difference? Determinate varieties bear their crop all at once and tend to be more compact. Don’t have much space? Try these. Indeterminate tomatoes bear fruit all season and grow longer vines. These vines require support (staking or caging) over the growing season. Got room and a couple of fence sections? Try these. I usually plant both so I can make tomato sauce, paste and barbecue sauce with the determinate varieties and eat the indeterminate tomatoes all summer long. Now let’s talk about types of tomatoes? From this organic gardener’s chair, I think of tomatoes as coming in three types – plum tomatoes, slicers and cherry or grape tomatoes. Plums – these are the kind you can use to make great tomato paste or pasta sauce with. Slicers – these are great for burgers or sliced and served with just a salt shaker. Cherry or Grape Tomatoes – these are tiny bundles of tomato flavor that taste great right off the vine. Again, I plant a few of all three types because I love them. You can pick and choose the ones you like the best and plant those. 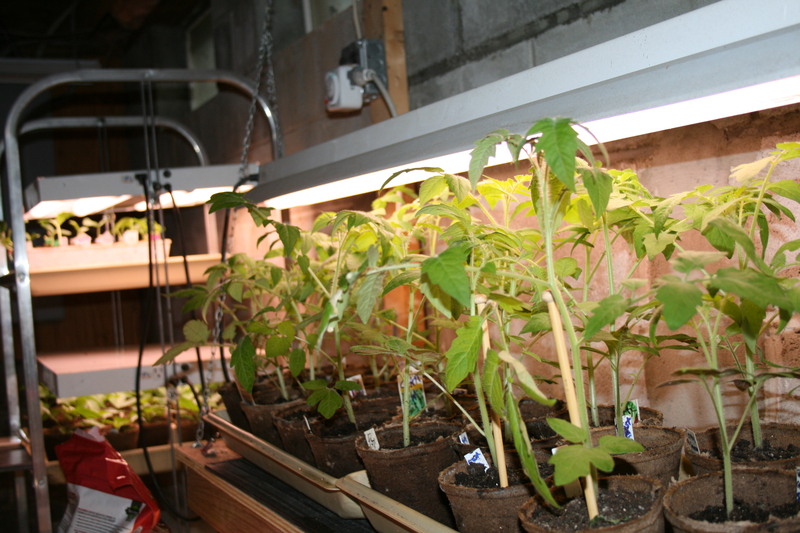 Tomatoes are warm weather plants; they really don’t like cold soil or cold air. You can plant them out on the ragged fringe of your last frost date but putting them in the ground too early may just stunt their growth. So tomatoes should not go into your ground until the soil temperature is at least 60 degrees. Tomatoes should be given some room to breathe. Plants should be 2 to 3 feet apart and rows should be 3 feet apart. This gives the tomato plants room to spread out, especially the indeterminate ones that can grow vines that are more than 9 feet long. Pick a nice sunny spot that drains well. The slight slope in my garden ensures that the roots of the tomato plants are wet but don’t drown. 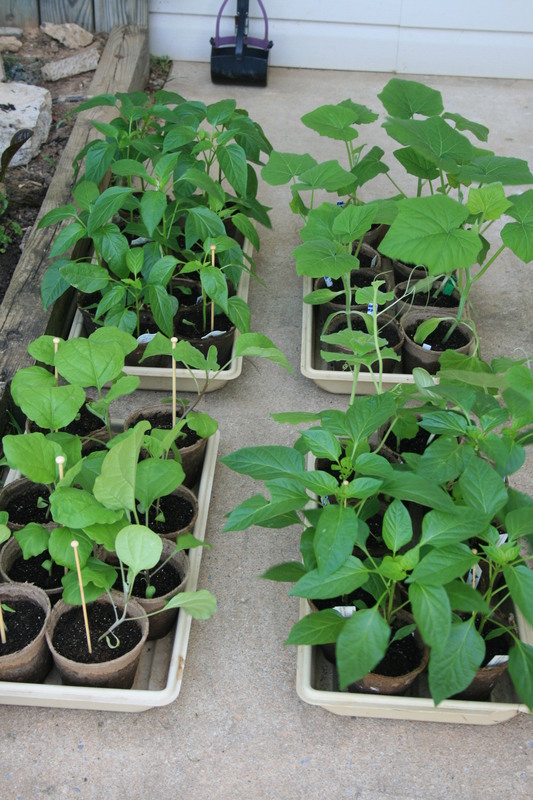 Remove all containers (plastic or clay) from the plants except peat pots. If using peat pots, just grasp the bottom and start to close your fist. That pincer movement punches small holes in the bottom that roots can slide through quickly. Strip off all but the top set of leaves. 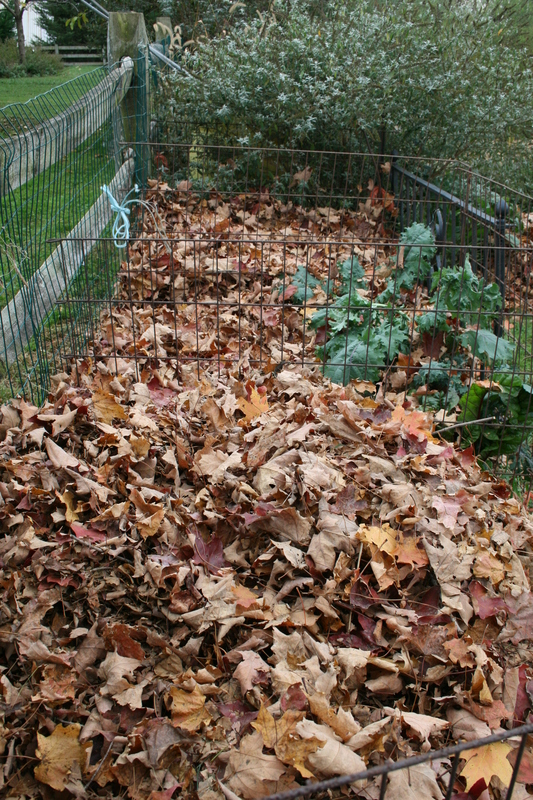 Make sure you dig a hole that is deep enough to bury the stem up to the very last set of leaves at the top. Yes, I really do mean bury them deep. The stem that you put underground will send out roots and very quickly anchor the plant and give it a lot of opportunities to take up nutrients and water. Fill the hole with the dirt you removed and tamp it down to make sure there are no pockets of air around the roots. Water the transplants in by pouring 1 or 2 cups of water on the ground at the base of the stem of each plant immediately after transplanting. NOTE: You can use a very weak liquid fertilizer (2 tablespoons to a gallon of water) if you want but I don’t fertilize until about 2 weeks after I have transplanted. Mulch with straw around each transplant. 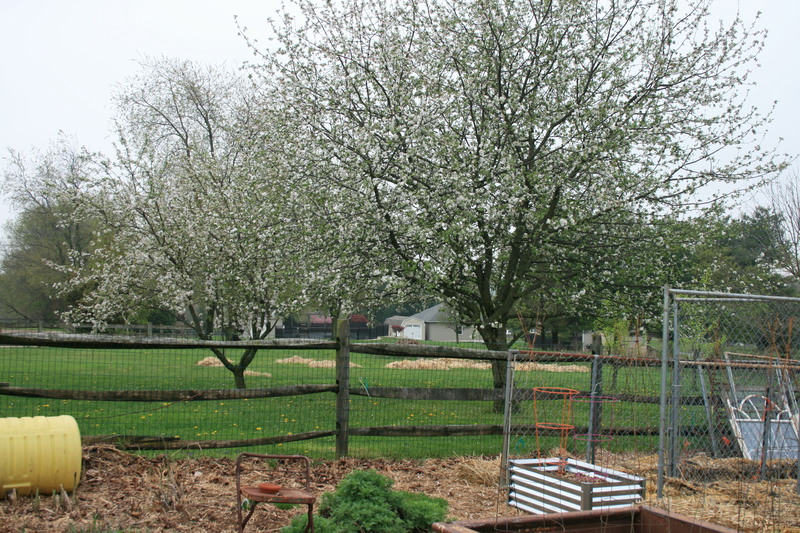 Mulching also makes for a weed free garden – the only state I want to be in when it comes to gardening. It also ensures that moisture is retained and to make sure rain water doesn’t splash up on the leaves of the tomato plants. Water that splashes up off the soil can cause verticulum wilt or mosaic tobacco virus, the two most common diseases in the tomato family. By the way, never smoke in your garden – you can make your plants sick, literally. Stake your tomato babies when you plant them. 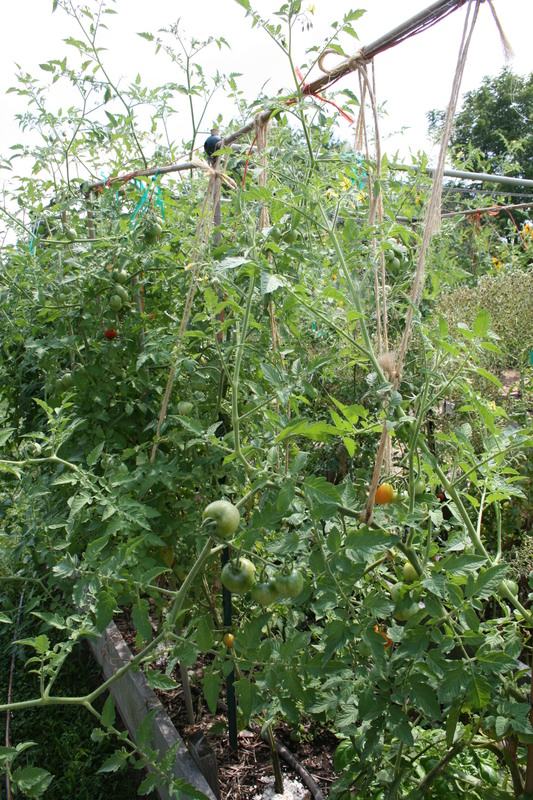 Tomatoes grow fast so if you wait, it may be too late to get a tomato cage or a stake in place. Staking prevents some diseases and improves your yield. It also makes it much easier to pick once the plants start producing fruit. What should you use for stakes? Visit any gardening or hardware store and pick up wooden stakes or, my favorite, metal stakes. I also use old fence section and have been known to use an old box spring on occasion. If it doesn’t rain and/or if it is very hot during the first week after transplanting, make sure to check the plants to see if they are drooping or wilting and pour another cup or two of water on them if they are. Always pinch off the first flowers on all your tomato plants. The plants are still trying to get established in the ground. They don’t need babies to distract them from growing into strong, healthy plants. When the second set of flowers appear on the plants, mix 2 tablespoons of Epsom salts into one gallon of water and use one cup for every foot of height the plant has – 2 feet = 2 cups. Epsom salts provide magnesium and sulfur – both needed to produce chlorophyll and allow for proper absorption of phosphorous and nitrogen. NOTE: Don’t use too much Epsom salts. If you do, you will get lots of beautiful, green leaves and bushy plants but not many tomatoes. Tomatoes should get 1 to 2 inches of rain a week. If it doesn’t rain, make sure you water them. I use soaker hoses. Soaker hoses save water and prevent the spread of soil borne diseases. 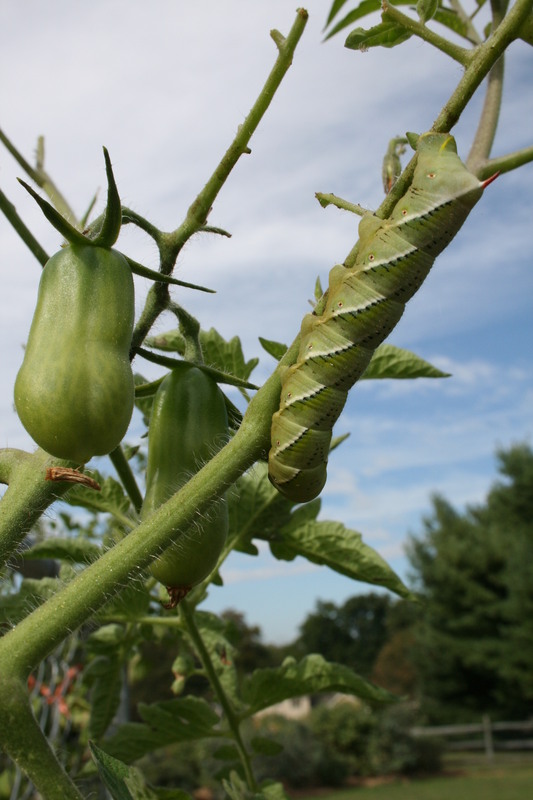 Keep an eye out for the tomato hornworm – a big green caterpillar that likes to eat tomato plants. If you see one munching through your garden and you don’t have trichogamma wasps, use pliers if you have to but pull it off and kill it. If you have trichogamma wasps, sit back and watch the show. The wasp lays eggs on the hornworm. 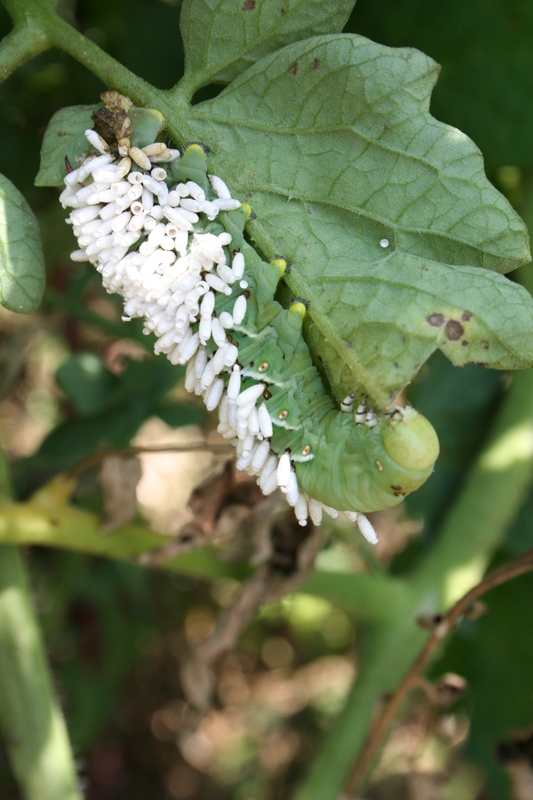 When the larvae hatch, they dine on their host. It’s not pretty but the wasps are an effective and natural control for these destructive pests. If you planted indeterminate tomatoes, take a few minutes a week to check for and remove the axillary or side shoots that come off the plant. But don’t go crazy and strip off a whole lot of leaves. Tomatoes can get sunburned – really – and burned fruit just doesn’t taste all that good. So trim lightly. Keep the plants from getting too bushy. Use their energy for production. Fertilize your tomato plants when the fruit are an inch or more long. I use fish emulsion mixed with water and poured around the roots of every plant. This is sometimes called “side-dressing” a plant. Another free fertilizer is crushed eggshells. Just put about 1/2 cup of crushed shells around the base of each plant. You can side dress the second time right after picking the first ripe fruit and make a 3rd and final application a month later. When it comes to harvesting your tomatoes, you can do it by look and feel or you can do it by temperature. If the average daily temperature is around 75 degrees and the fruits are red, they are ready to be picked. And don’t refrigerate tomatoes. The flavor and quality of the tomato will be much better if it is kept at room temperature. One of my favorite resources for learning about tomatoes is online. 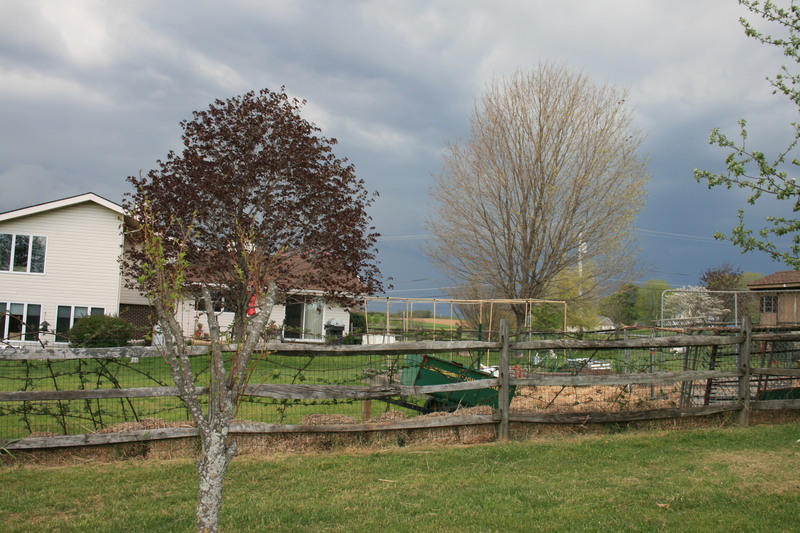 Although it is a Missouri extension office, the basic information works for any gardener, almost anywhere. And that is how to grow tomatoes. 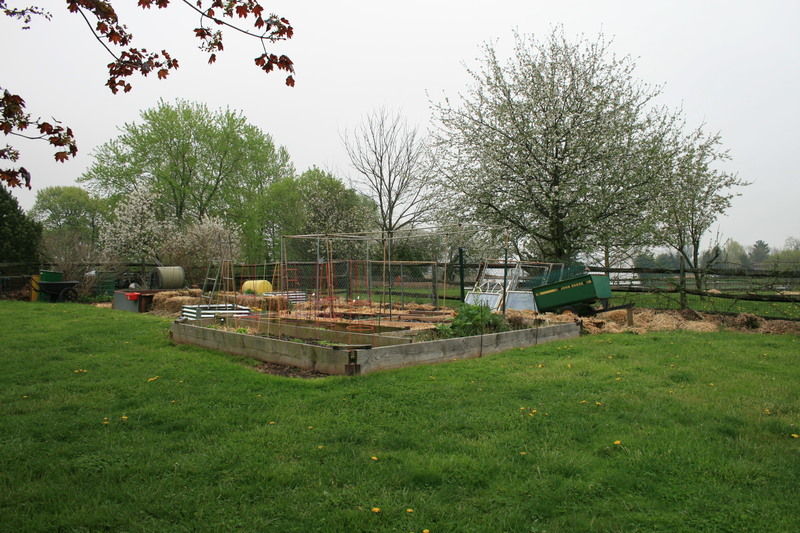 So, what makes organic gardening practical? Just this. You can grow a whole lot of healthy, tasty food, literally, for pennies. What’s the trick? My garden laden with organic veggies. For instance, you don’t have to buy chemicals or herbicides. You don’t have to have fancy sprayers or a rototiller – not even one of those small ones named after the bug that prays. In fact, if you pay a bit of attention, you already own just about everything you might need to get started. What you don’t own, you can usually get, free. How does this work? A little planning and a bit of forethought are all it takes! Newspaper – free if you ask your neighbors and co-workers for them. You can use it for mulch and make transplant pots with it, too. Straw – free if you find a farmer who has old or moldy straw which works just as well as the golden yellow stuff. 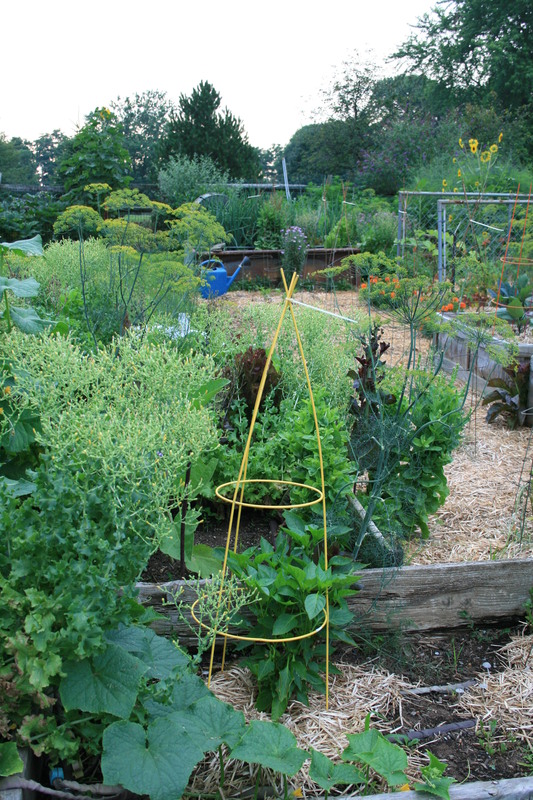 Trellises – made from some found items, your cukes, tomatoes and peppers will love climbing up or grow on these. When I say found, I mean things like this old headboard from a day bed that I found on the side of the road. I use for climbing vegetables like cucumbers. 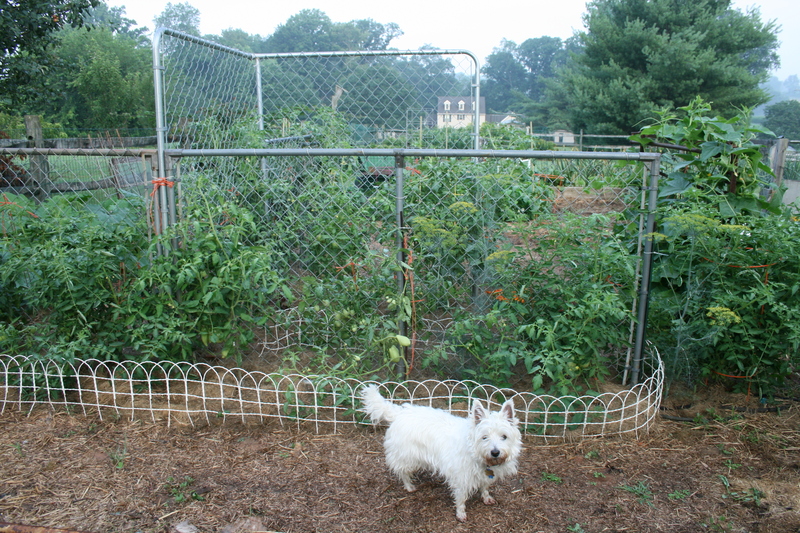 Or how about chain link fence sections and hay bale ties for growing tomatoes or training peppers or eggplant? I got these fence sections for free, too. And I have been using them for over 20 years! By the way, the dog isn’t free and he doesn’t do too much supporting! He can, however, pick his own tomatoes and blueberries. And the decorative fence – my attempt to slow him down just a bit, was free, too. Twine – free if you buy straw by the bale, save the baling twine and use it to tie up plants. You can also get tons of baling twine in any horse barn. NOTE: Do NOT use green baling twine. It has been treated with strychnine to kill mice and rats. Old, sheer curtains, old bed sheets and even old mattress covers – free if you save yours or ask relatives and friends to give their old ones to you. 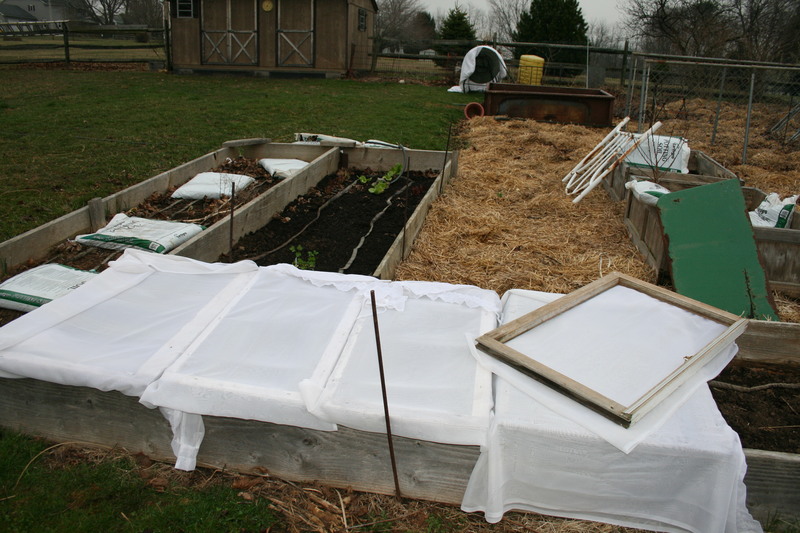 They don’t look as pretty as commercial row covers but they will keep frost off your baby plants. and, they’re free. 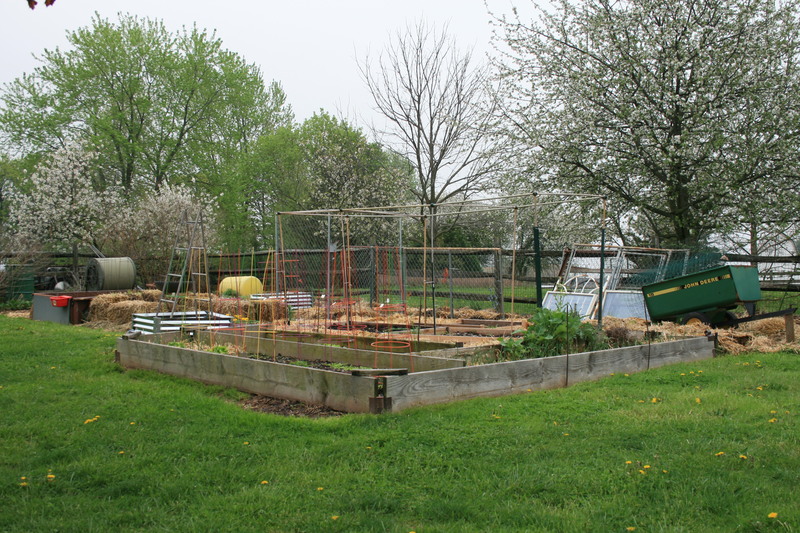 Access to a public library – free and there are always books and magazines about organic gardening ready for you to browse through, borrow and take notes from. Oh, and libraries have computers and internet connections. Using them is free. And online is just FULL of ideas, tips and advice on organic gardening. All you have to do is put in your search terms and hit Go. An old 3-ring binder and some paper – can be free if you ask co-workers to save used copy paper and write on the back. NOTE: I consider this a requirement for my gardening. If I don’t write down a tip or a “lesson learned”, I can easily forget what I learned and end up repeating my mistakes again and again and again. Here’s what would be nice to have if you move beyond dabbling in organic and decide to grow most of your produce every spring, summer and fall. Bit of advice? Before you buy any of these items, look on http://freecycle.org or http://craigslist.org to see if you can get them for free or cheap! Peat pots – I use 2” and 4” peat pots and hate paying the price for them. But they make transplanting easier for me and less stressful for the baby plants so I pay but I try to get them online rather than in a big box store where the price is always higher. 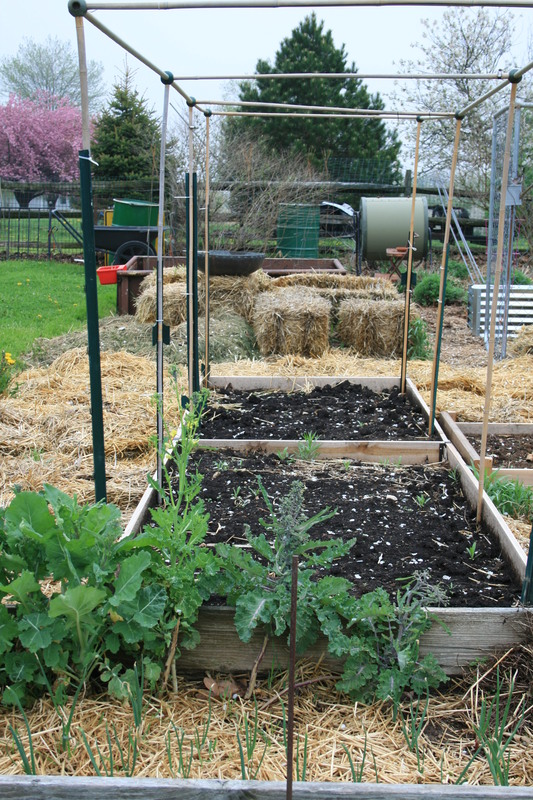 Raised beds – I make mine with 2 X 12s (NOT pressure treated) and plastic anchor joints from Home Depot. They are so easy to do and won’t cost you $200, just a bit of sweat equity. Raised beds are easy to make. Gloves – I consider these nice to have because you really can dig in the dirt with your hands and suffer no ill effects. But, in fact, I don’t use gloves because I love the feel of soil in my hands. Two hand tools – both of mine are Fiskars because of the grip, the design and the lifetime guarantee — the big grip knife and the hand trowel. A pitch fork – used to move the straw back from the fence sections a couple of weeks before planting so the soil can warm a bit. A watering can – very nice to have if you want to hand water fresh transplants. Fish fertilizer – I use Neptune’s Harvest hydrolyzed fish but am currently “brewing” my own using fish heads and bones that a friend of a friend got me for free, a 55 gallon drum and water! Beneficial insects – there are quite a few beneficials and you can buy them. They may seem pricey, at first, but you don’t have to buy them often and you will truly be glad you did the first time you see a tomato cut worm trussed up like Gulliver and covered with small, white egg casings of the trichogamma wasp. 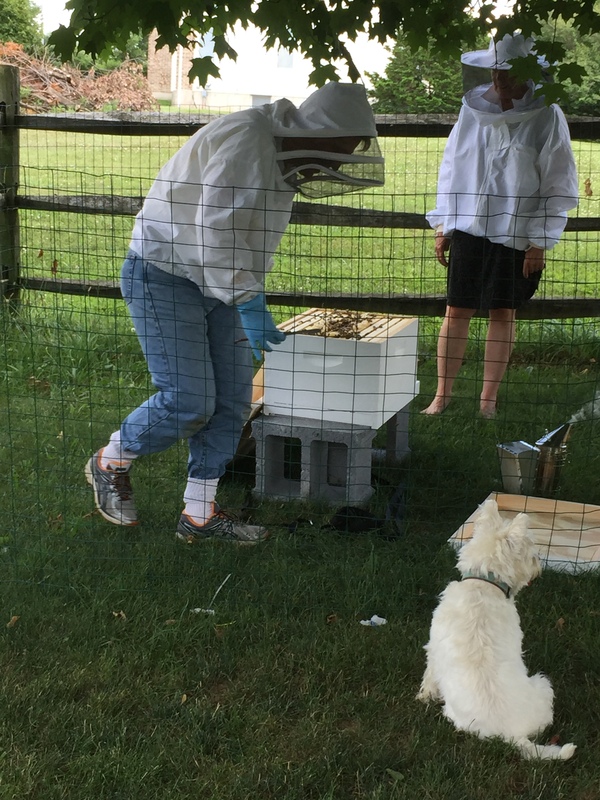 I bought nematodes and wasps 2 or 3 times when first establishing my garden but no longer need to buy them. They live and work in my backyard. A good pair of secateurs – hand held clippers that can cut through a 1” branch like it was butter. These let you trim inside the bush not hack off the outer branches. A garden club in your neighborhood. Membership dues are usually low, ours is just $25 a year but you might enjoy some ideas and tips from your gardening neighbors. WARNING: not everyone is organic so pick and choose who you listen to and what you are going to do. A good bug book – this could be one of your larger expenses but, believe me, you will be grateful for putting out the cash. Why? There are a whole lot of good bugs in the garden that will do battle with the bad ones without you lifting a finger. If you don’t know the good from the bad, you could be killing your soldiers and giving the enemy a chance to overrun the battlefield, i.e. your garden. White vinegar and a big box of salt – it does not have to be iodized. You’re just going to mix them together and use them to kill ants or a persistent weed like poison ivy or both. A small propane torch – the handheld kind – I use this to burn tent caterpillars off my cherry trees. It’s a bit brutal but it burns the nest and the caterpillars before they can strip my trees. An old knife or pair of scissors nicked from the kitchen – nice to have on hand to cut baling twine and cut off produce rather than try to pull it off. Having lost several battles with eggplant and peppers, I tend to keep a knife in my garden basket and use it with malice aforethought. www.craigslist.org – people are always selling fence sections, hand tools and possible trellis material at incredibly low prices. Check the ads out before you lay down good money for a tool someone else bought but no longer wants or needs. www.freecycle.org – I find this site painful but you will find free stuff on it so it’s almost worth it. You have to be a member to see the posts. And navigation is not just basic; it’s irritating. But you will be able to pick up a lot of the “nice to haves” on Freecycle for…free. 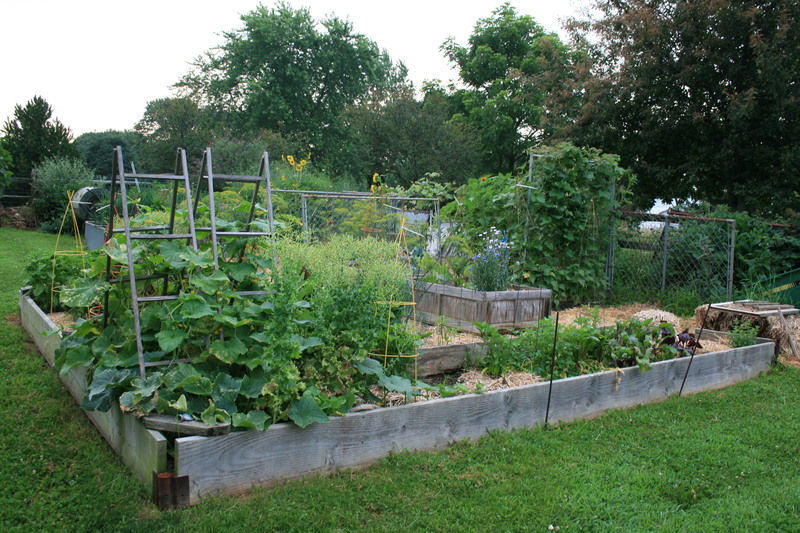 If you ever wanted to learn all about organic gardening, the good, the bad and the ugly…just sign up for this blog and sit back. Every week or so, I am going to upload a chapter of my organic gardening book which you can read for free! 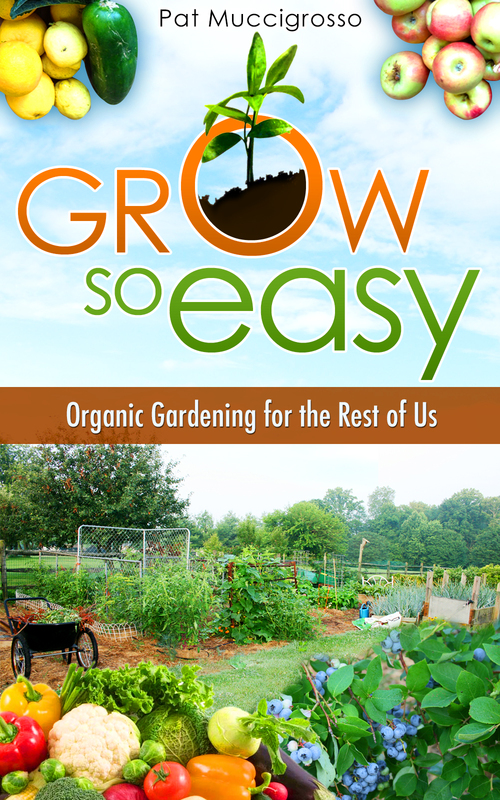 Today, I am starting at the beginning…that would be Chapters 1 & 2 (the chapters are short) of Grow So Easy; Organic Gardening for the Rest of Us. Enjoy! My all organic, backyard garden. Remember when you decided you wanted to start a garden? You told a friend, spouse, garden center guy and then got bombarded with miscellaneous stories of gardening disaster. All that support really made you want to go out and start tilling the soil, right? I hate it when I hear someone telling another would be gardener how hard it is to get things to grow or how easy it is to kill this vegetable or that one. Why? Because, instead of gardening, you probably wanted to run home, mix up your favorite drink and sit down with the remote control. 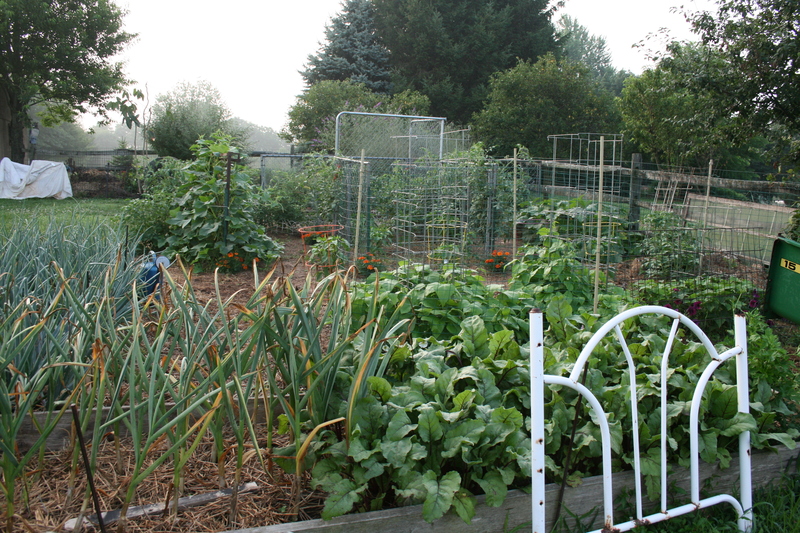 Too many people in the gardening business write or talk about how hard organic gardening is or how complicated it is. Sometimes that’s all it takes to make people who read their articles or buy their books put down the shovel or rake and walk back into the house. They’re lying! Organic gardening is easy! It’s cheaper than going the chemical route and it’s fun! 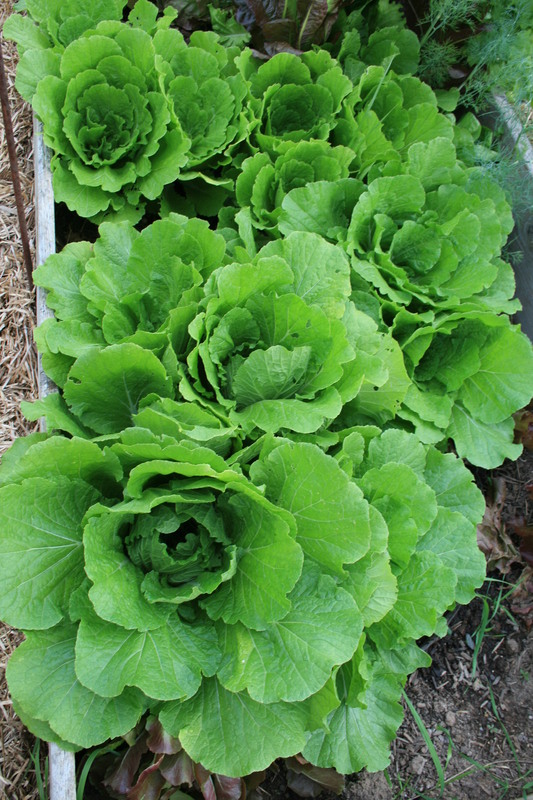 Organic lettuce is easy to grow. The truth is gardening can be as easy as you want to make it. It’s all about what you want to grow. Figure out what you want to plant, how many plants you want to put in, how large a garden space you want and what works in your planting zone. 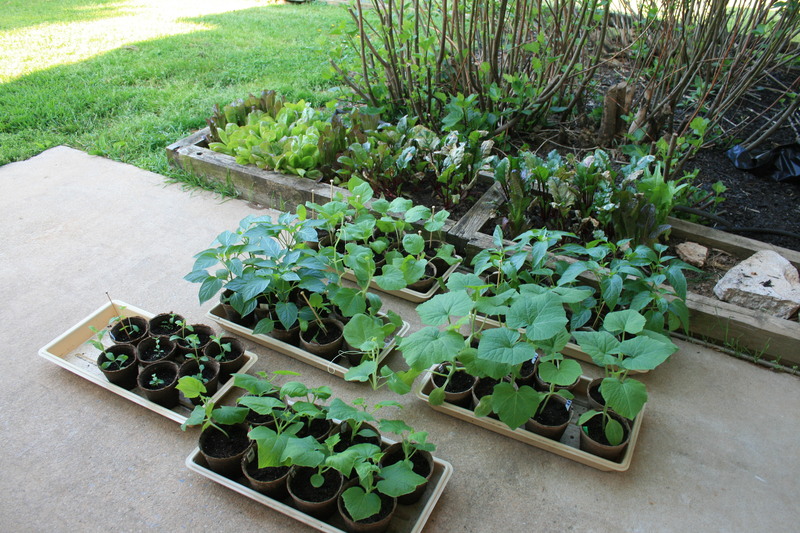 Start small and only plant those crops you want. Lettuce is so easy to grow that it practically raises itself! It’s a cool weather crop that loves early spring and late fall. And it helps save you $5.00 for organic greens in the store! Think about it. Stores sell spring greens mix for $5.00 for 12 ounces. Fifty two weeks of buying greens comes to just under $300. You can raise enough for you and your significant other for less than $3.00 a year. Some seeds, some dirt and some water, a little kindness and a lot of sunlight and you are on your way to creating your own organic garden. So, dig in! This book is designed so you can pick it up, look up a specific plant or bush and read about the good, the bad and the ugly for just that one selection. Or you can read it cover to cover – starting at the back if you want to and working forward. 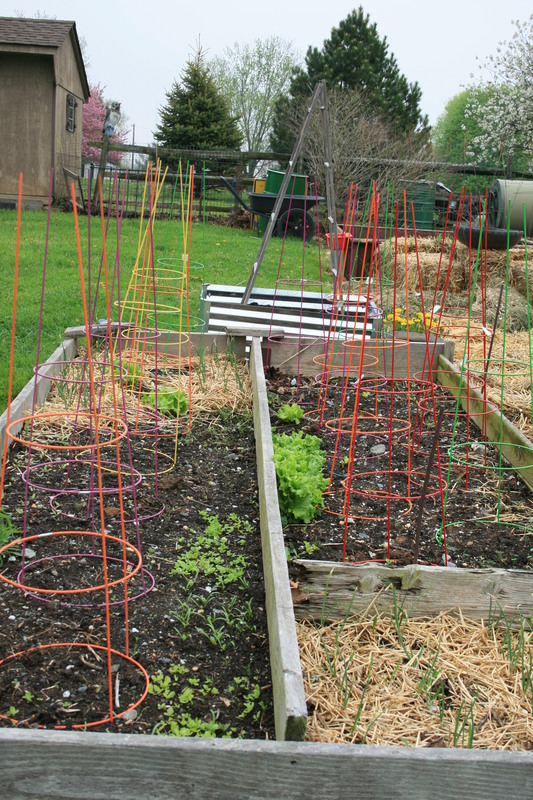 Because a lot of us gardeners aren’t very linear. And many of us would rather “give it a go” than sit down and read about gardening. So I tried to give you what you need, when you need it. Organic gardening is all about getting your hands dirty! on techniques like composting, using organic fertilizers or even doing battle with Japanese beetles? Check the Table of Contents and flip to the right page. Want the back stories? The pain of losing a loved one to Verticillium Wilt? Make a cup of herbal tea, start here and just drift through the book, laughing, learning and, I hope, getting a powerful yen to get out there and get dirty. PS – if you can’t find it in my book, I didn’t kill it.